Funny. I tried FF and got the same response to when I use Chome although FF gives me an option to run the file or save it. 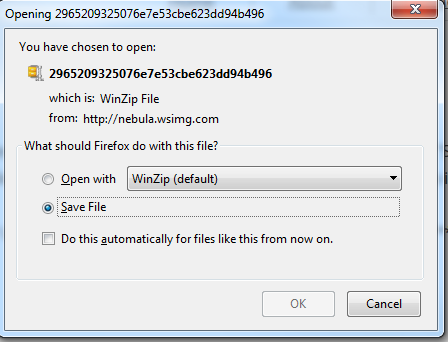 When I use save, I get the same download filename with .zip as I do in chrome. First it asks do you want to OPEN or SAVE.. If you say SAVE, the filename has .zip on the end. Then I changed the behaviour of FF so that doesn't ask where I want to save the files and instead use a default download directory (I normally never do this since I save content depending on what it is to different locations..
And I got the same response that you got. The saved filename has no .zip on the end. Need to use my debugger to see exactly what the webserver is serving up for the filename to see if FF is just being too cute or not. Makes FF always ask and confirm where you want to save the file and does not mess up the filename (apparently). That being said, I am not a big fan of the long number for a filename in the first place. I would always rename it to something that makes sense so I know what it is later. It is quite often for software to use a generic filename and not include the version number which I think is important. (05-22-2015, 06:49 AM)krelvin Wrote: Which version are you trying to use? there are now a number of them. That one since I planned to use it on a new WIN8.1 system. Downloaded with FireFox since that's my main browser and I avoide IE as much as humanly possible because it's a piece of junk. I was able to unpack it by putting the extension on the file manually, but the installation was a mess and apparently assumed that I had my card in the local slot and wanted to set it up. My card is already set up (after long struggle) the way I want it and it's in my machine where it belongs, and so I gave up and used the old version which worked just fine, thanks. Just setup SleepMaster with an SD card on my server (linked to the AirCard on my Airsense 10 through SleepMaster) so it works with ResScan too as others have done - brilliant! The ability to pull my data from my machine without taking the card out has been a big hit for me. Read my data every morning and sometimes in the middle of the night if I get up and then go back to sleep. It is so easy to use once setup. A new version of Sleep Master is available for MAC OS X! Just uploaded a new Sleep Master Java for Ubuntu Version v3.0.0.4. Fixed a few bugs and added a progress indicator to entertain users while long operations are taking place. "An error has occurred at 1065. Sleep Master will now exit." I find some data in the directory. There are several days missing in the DATALOG Directory and there is no SETTINGS Directory. The data The FlashAir is transmitting was copied from my ResMed AirCurve 10 SD card to the FlashAir. My ultimate goal is to transmit the data and store it on the SD card which I will leave in my computer and read it with ResScan. I read in this thread that others have done this. The error you received indicates that Sleep Master did not receive a reply from the FlashAir for a list of files in a directory. You might try getting a couple more days of sleep data on the FlashAir! Also, make sure the data you copied to the FlashAir copied accurately. Mine wouldn't connect this morning, so will have to redo the setup on it this evening when I get home. Thank you so much; I reformatted the FlashAir and loaded new data, downloaded the .35 version and everything is working well. Love this application and appreciate your effort and your response to our problems.